Partygoers at music venue, Terminal 5, in Manhattan, N.Y. (Photo: Tim Bugbee, The Big Takeover), will be taking part in a “Blade Rave” on Oct. 9. The dance party was inspired by the “blood rave” scene in Blade (1998). (Photo: New Line Cimena; Mixmag) Photo montage by Anthony Hogg. On Aug. 30, 2015 Vamped published my article discussing Insight-Event’s upcoming “Blood Rave” to be held in a yet-to-be-disclosed location in Amsterdam on Oct. 31, 2015; a rave that is going to shower dancers with 5,000 litres of (possibly) real blood. Before the article’s publication, I came across a similar event: BBQ Films’ “Blade Rave,” which will be held at Terminal 5, a music venue in Manhattan, N.Y., on Oct. 9, 2015. I was struck by the event similarities, so I decided to investigate whether they were merely coincidental. I contacted BBQ Films via their info account on their website on Aug. 26 and received a reply from BBQ Films co-founder, Gabriel Rhoads, on Aug. 27, which was accompanied by a press kit and an offer for press passes. I would have loved to attend, but I had to decline the tickets since the event was too far from my home in Vancouver. Insight-Events had posted a teaser video for their “Blood Rave” too, but it wasn’t a recreation of any sort; only a four minute extract from the movie’s opening scene. They also posted an unlisted eight second Youtube video, but the quality was nothing compared to what BBQ Films had to offer. We saw that yeah, and as you noted, we went public with our event first. At the end of the day though, we consider BBQ Films as part of a larger movement of immersive cinema. So it’s great to see that creativity spread. I’d like to point out at least one MAJOR difference between our events, however. These guys in Amsterdam publicized using actual blood, reportedly. This sounds like a health code violation waiting to happen. We make sure our events are safe and fun for all. Note we’re also an immersive screening – with the film and elements from the film beyond just blood. continue their experience after they walk out of the doors of the convention center. We bring our events to a wide range of people, but we are thrilled with the partnership with Comic Con – this year is our first. We’ll be inviting in folk from Comic Con and a broader audience as well. We all saw BLADE (and many of the other films we present) as kids. If you’ve seen the movie, and you’re a fan of raves, who hasn’t imagined themselves in that party? The same thing goes with buying a record from the Empire Records store. Or even attending Bernie’s amazing houseparty from Weekend At Bernie’s…. Regular tickets are now available at a cost of $56 for Vampires and Familiars ​/ $108 for ​Purebloods​, with a portion of proceeds going to charity (TBA in advance of the event). All ticket levels will bring you into the world of BLADE, with the immersive cinematic detail that guests have come to expect from BBQ Films. All tickets include a screening, live music and performances, a limited-edition event poster, and more. ​Purebloods​ get the special treatment they deserve as centuries-old royalty, including access to private areas, unique performances, and special one-of-a-kind gifts. ​Together, we raise the blood god. At the time this article went to press, Rhoads had not yet announced which charity the proceeds will be going to. We have been integrating music into our shows for years now. Music is one of the most transportive experiences — just think about an evening seeing your favorite artist. When we approach the right artist, we show them a stage that’s a natural fit. When we get that right, they are very receptive. This was as true of the artists in our current show as it was for GWAR, or Richard Usher from Partners in Kryme, or the artists from Postmodern Jukebox. We can’t give too many details about the blood rain, but we absolutely never considered using real blood. We are consulting with field experts in producing this event, and will be using a safe non toxic water soluble substance that washes off easily. Guests will be warned in advance of the rain, and will be able to decide if they want to participate. We are dedicated to creating an experience where everyone can have fun. The only question I posed to Rhoads that he didn’t answer was: “Will Blade be making an appearance? Did you manage to get any actors from the original movie to agree and join in the fun?” He said: “I cant comment on this.” Perhaps the folks attending the Official Afterparty of New York Super Week are in for a fangastic surprise? my article discussing Insight-Event’s upcoming “Blood Rave”: Erin Chapman, “There Will Be Bloed: Uncovering Holland’s Halloween Blood Rave,” Vamped, Aug. 30, 2015, accessed Sept. 10, 2015, http://vamped.org/2015/08/30/there-will-be-bloed/. 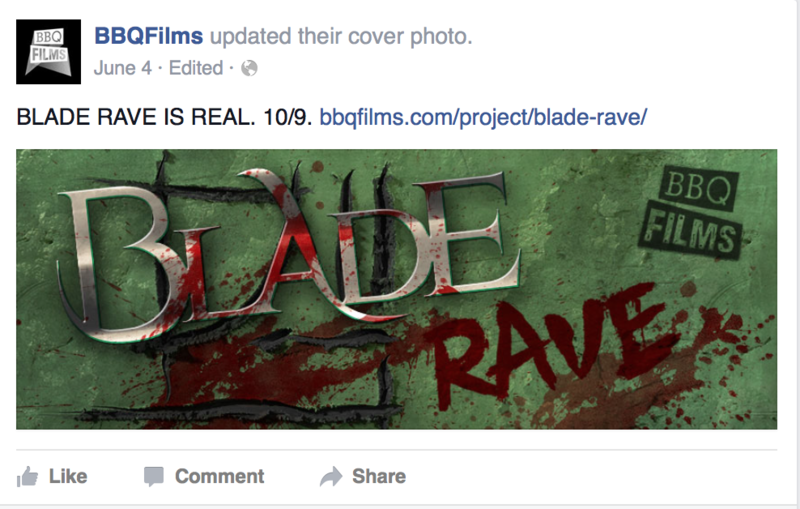 officially announced on BBQ Films’ Facebook page on June 4, 2015: “Blade Rave,” Facebook event posted by BBQ Films, June 4, 2015, accessed Sept. 10, 2015, https://www.facebook.com/BBQFilms/photos/a.341858219188628.74949.216561561718295/933117136729397/?type=1. archive.is link: https://archive.is/SH4S7. “LA MAGRA IS COMING”: “LA MAGRA IS COMING,” Vimeo video, 1:46, posted by BBQ Films, June 2, 2015, accessed Sept. 10, 2015, https://vimeo.com/129571797. posted a teaser video for their “Blood Rave”: “Blood Rave Intro,” YouTube video, 4:07, posted by Blood Rave, Aug. 21, 2014, accessed Sept. 10, 2015, https://www.youtube.com/watch?v=qwXLf-Xri0U&feature=youtu.be. an unlisted eight second Youtube video: “Blood Rave,” YouTube video, 0:08, posted by Blood Rave, Aug. 19, 2014, accessed Sept. 10, 2015, https://www.youtube.com/watch?v=6YKYePUG2J0. We saw that yeah, and as you noted, we went public with our event first: Gabriel Rhoads, e-mail message to author, Sept. 9, 2015. “create immersive cinematic experiences in extraordinary locations”: BBQ Films homepage, accessed Sept. 16, 2015, http://bbqfilms.com/. archive.is link: https://archive.is/etuj3. We use set builds, actors, music, food, and beverage . . . : Rhoads, e-mail message to author. BBQ Films’ website has announced: BBQ Films homepage. continue their experience after they walk out of the doors of the convention center: Rhoads, e-mail message to author. their press release says: BBQ Films, BBQ Films BLADE Lineup Announcement, 2015. We all saw BLADE (and many of the other films we present) as kids: Rhoads, e-mail message to author. Regular tickets are now available at a cost of $56 for Vampires and Familiars: Ibid. Rhoads had not yet announced which charity the proceeds will be going to: However Rhoads’ LinkedIn profile lists his work with The Edna McConnell Clark Foundation, an organisation which “seeks to transform the life trajectories of vulnerable and economically disadvantaged youth. We make large, long-term investments, frequently partnering with other funders, and promote effective public and private support of nonproﬁts with a potential for growth and compelling evidence that they can help more young people become successful, productive adults.” Edna McConnell Clark Foundation, 2015, accessed Sept. 18, 2015, http://www.emcf.org/. archive.is link: https://archive.is/nRrqi. BBQ Films managed to get a stellar music line up for the event: BBQ Films, BBQ Films BLADE Lineup Announcement. We have been integrating music into our shows for years now: Rhoads, e-mail message to author. but BBQ Films was able to discuss their concept more openly: BBQ Films, BBQ Films BLADE Lineup Announcement. We can’t give too many details about the blood rain: Rhoads, e-mail message to author. “Our event hosts at Terminal 5 are pros”: Ibid. “I can’t comment on this”: Ibid. If you’re looking for other vampire-themed events this October, check out “There Are Such Things! Vampire Studies Symposium 2015.” For further details, visit: http://vampiresymposium.com.